The newly renovated Royal Sonesta Boston combines modern style with breathtaking city views right along the famous Charles River. Straddling both Cambridge and Boston, you’ll be at the center of the area’s dining, nightlife, sporting events and attractions. 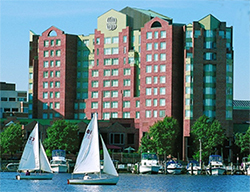 A limited number of rooms have been reserved at the Royal Sonesta Hotel until March 28, 2019. Please call the hotel directly at (617)-806-4200 and ask for Reservations or toll free at 1-800- SONESTA (766-3782). It is important to identify yourself as part of the Harvard Pulmonary & Critical Care Course 2019 to take advantage of the special group rate. You may also make your reduced-rate reservation online by March 28 by clicking on this dedicated reservation link. *Please note that the discounted room block may sell out before the deadline. Please do not make non-refundable travel arrangements until you have received an email from our office confirming your paid registration.